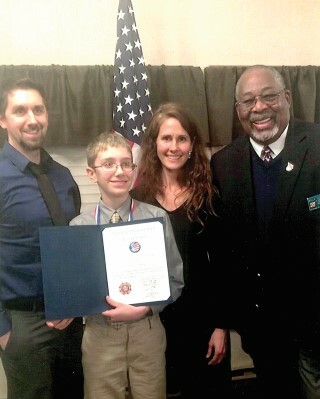 Sam Williams with his parents and Windham VFW Commander Willie Goodman. Sam Williams, a student at Windham Christian Academy, was the state winner of the Veterans of Foreign Wars Patriot’s Pen annual essay contest. Sam entered at the Windham Post level, moved on to win the district level, and on Saturday night at the state awards banquet in Bangor, he was awarded first placed with a certificate and a $500 check. Sam’s essay will now be entered to represent Maine along with winners from other states to determine the national winner who will get an all-expenses paid trip to Washington, D.C. and a cash award. Windham VFW 10643 and our community are very proud of Sam.